Reconstruction of Sta. Chiara, Naples. The Duke Wired!/University of Padua collaborative team was recently invited by the Paisajes espirituales research group at the University of Barcelona to present their digital reconstruction of the choir screen at the church of Santa Chiara in Naples, June 14-16, 2017, in Barcelona. To create a highly detailed 3D point cloud of the church, the team collaborated with Dott.ssa Emanuela de Feo, from the University of Salerno, who had made a laser scan of the structure. 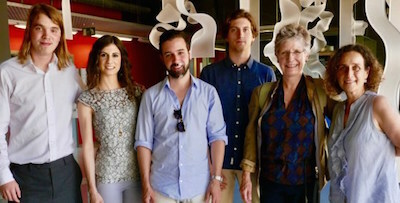 The Duke team, which consisted of digital art history alumnus Lucas Giles (M.A. 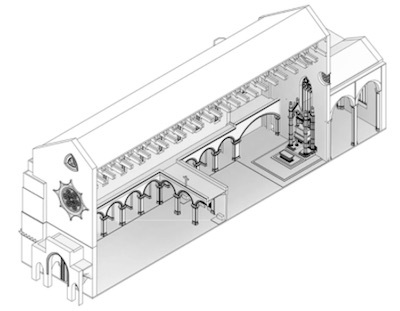 ‘16) and Caroline Bruzelius, Anne M. Cogan Professor of Art History, then worked closely with two architecture students from the University of Padua, Elisa Castagna and Andrea Basso, to construct a CAD model of the church and choir screen. The team used as evidence not only the GPR and laser scans, but also historical documentation of contemporary choir screens.